Google’s new Material Design brought plenty of white to many users’ Android phones. As nice as the new look is, there’s one critical issue: it uses more battery on OLED devices. The Mountain View-based search giant admitted as much at its Android Developer Summit. Unfortunately, there is no universal dark theme for Android users yet. Samsung has one in the works with its upcoming Android Pie and One UI update. 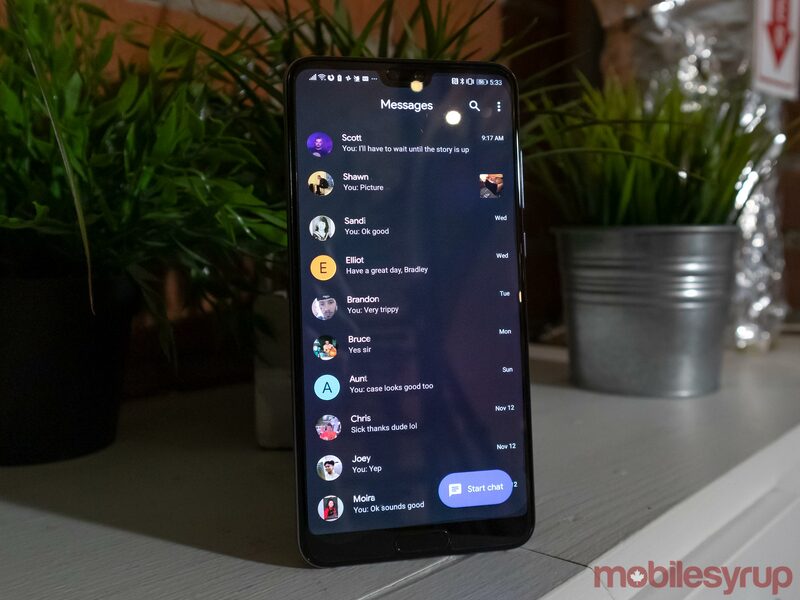 Other manufacturers, like OnePlus and Huawei, added a dark theme to their phones. However, these modes don’t change much more than the Settings app, the quick settings buttons in the notification shade and some of the default apps. 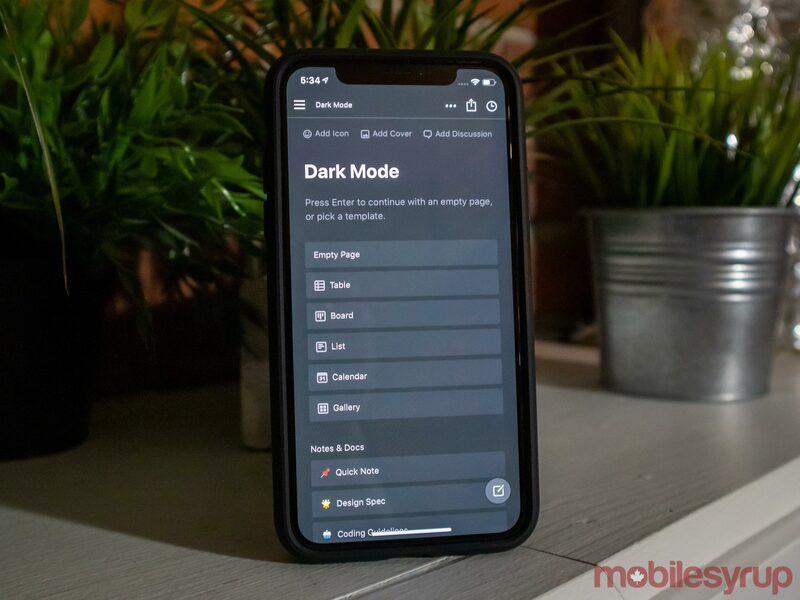 Even the Google Pixel has a dark theme option, and Microsoft and Apple have added dark modes to Windows and macOS as well. Thankfully, several apps are adding dark modes to help curb the battery usage. Some are ‘true dark,’ using black backgrounds so that OLED screens use next to no power — OLEDs turn pixels off to display black. Others are just ‘dark,’ using dim greys or blues to reduce power usage. Regardless, if your phone has an OLED screen and you’re looking to save some battery, dark mode is the ultimate solution. Despite the lack of a universal dark mode, you can still turn many parts of your phone dark. Below is the comprehensive MobileSyrup guide to making your phone dark. In most cases, you can enable dark mode through a toggle in the settings menu or through a button in the side panel. We’ll explain if an app has a more demanding process. There are plenty of ways to communicate with people using your smartphone. Unfortunately, many of them don’t offer a way to make your phone dark. Messages, thankfully, does have a dark mode toggle. Plus, if you use Messages on Web to text from your computer, you can use a dark mode on that too. If you’re a WhatsApp user, there isn’t an official dark mode right now. However, you can customize the wallpaper and use a black or dark colour instead. The company is reportedly working on an official dark mode for Android. Facebook Messenger is also working on a dark mode as part of its upcoming redesign. Keeping up with the news is more important than ever, and thankfully there are several options to read in the dark. 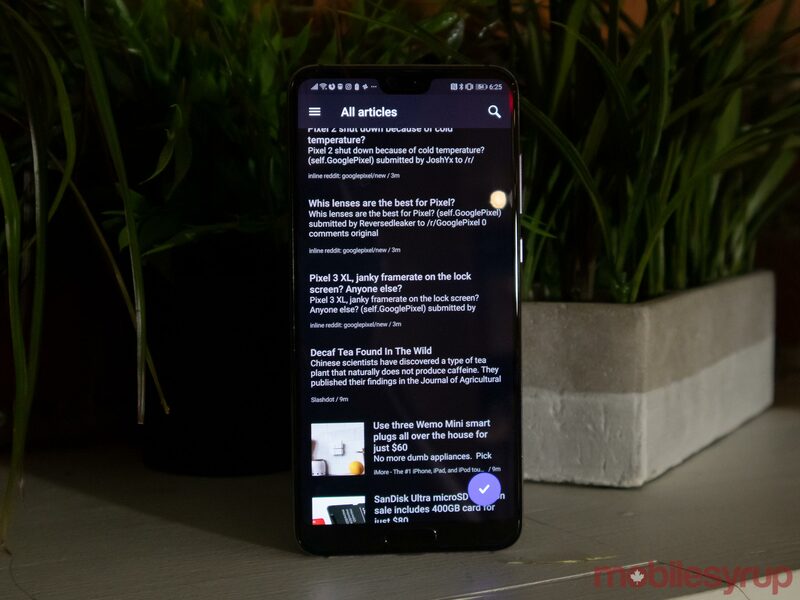 Google News, for one, offers an excellent dark mode selection, with an ‘always on’ dark mode as well as options to turn it on automatically at night or when the battery is low. If you like to use RSS readers, Inoreader offers a dark mode option as well. Read-it-later services like Pocket and Instapaper have robust dark options too. Changing the theme of your phone’s keyboard is a feature that’s been around for a quite a while, and it’s an easy way to immerse yourself in darkness. 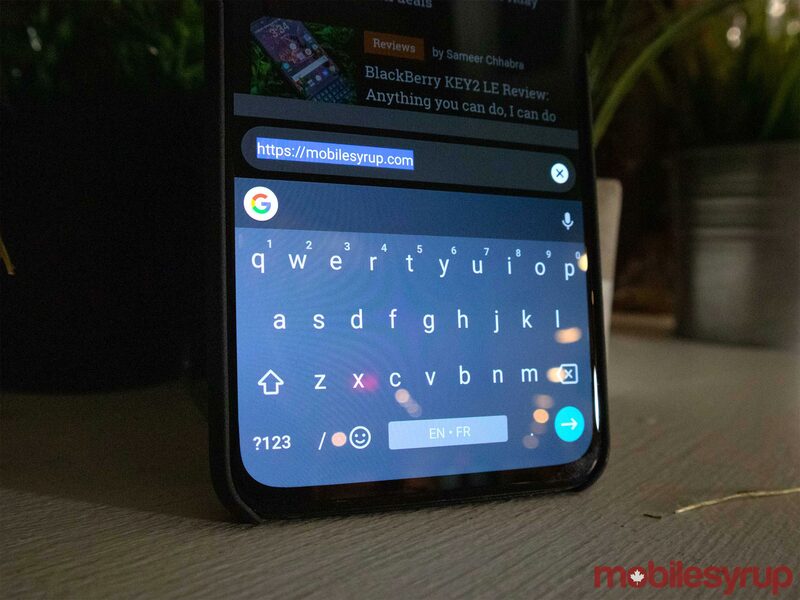 SwiftKey and Fleksy both have a variety of themes, and several use dark shades of grey, blue or black which should help to make it seem like a dark mode. Gboard and Minuum are great keyboards for users that like switching from dark to light themes automatically. Gboard has an option that changes the theme from your selected colour to a darker default shade when your phone enters battery saver mode. 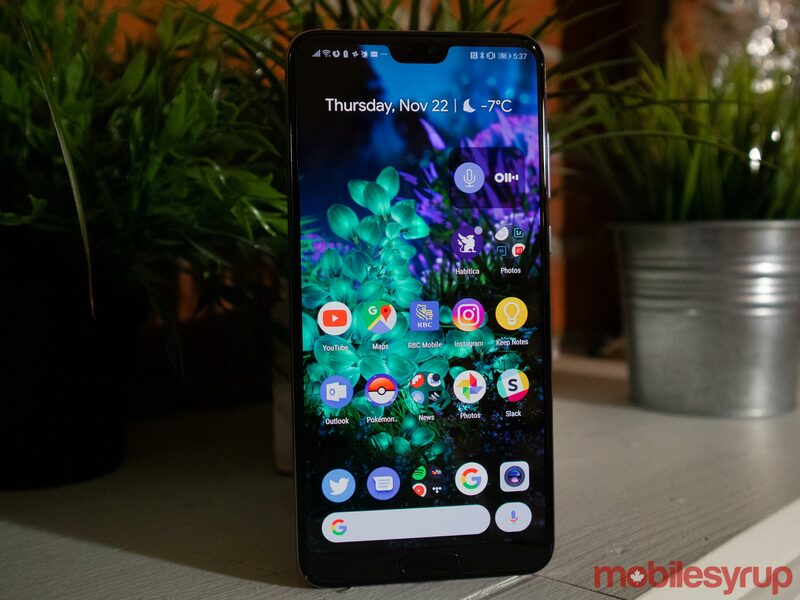 Unfortunately, this feature only works with some phones like the OnePlus 6T, but not the Huawei P20 Pro. Minuum has an adaptive theme that changes the colour of the keyboard based on the time of day. During the day, it’s a shade of blue. It gets darker as the sun goes down. One of the most significant time sinks on my phone is social media, and thankfully, some of these apps are offering a dark theme to save my poor eyes. Twitter, for example, offers a dark mode that turns the whites of the app into a more comfortable dark blue. YouTube has a dark mode as well. In fact, it was the app Google used to measure the battery drain caused by light and dark apps. Reddit offers an excellent dark mode as well, which is great for the late night lurking sessions. 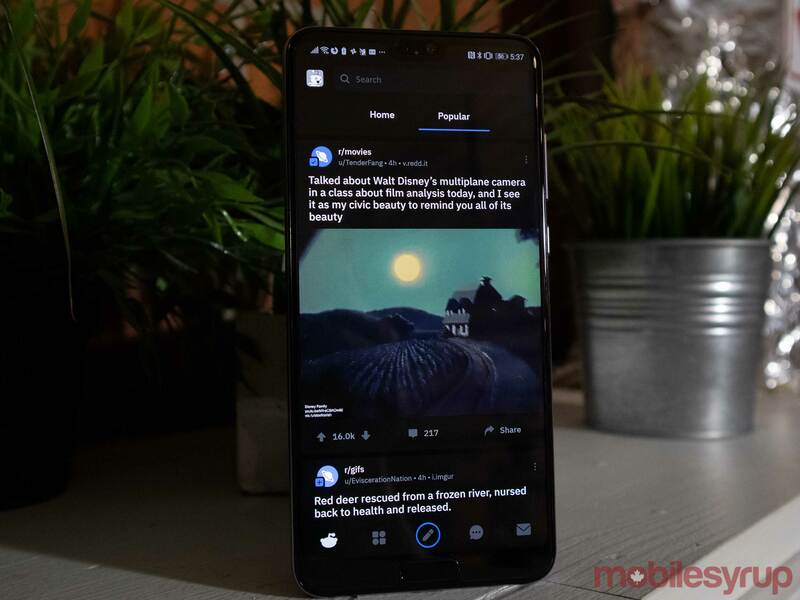 Despite the desire for dark mode, some of the big names in the social media sphere are holding out. Facebook, for one, doesn’t have a dark mode. Neither does Instagram, an all-white app that could certainly benefit from a dark theme. There aren’t any apps with a dark mode, per se, but there are a few that have a darker theme by default. Spotify, YouTube Music and Tidal all have dark interfaces by default. 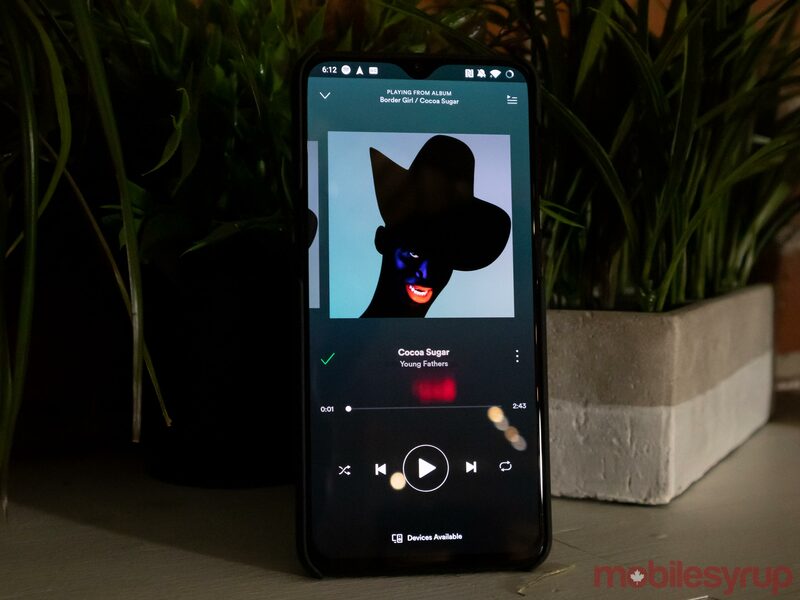 There is a chance that somewhere down the pipeline Google may add a dark mode to Play Music since the company has been adding the option for dark themes to a few of its major apps. 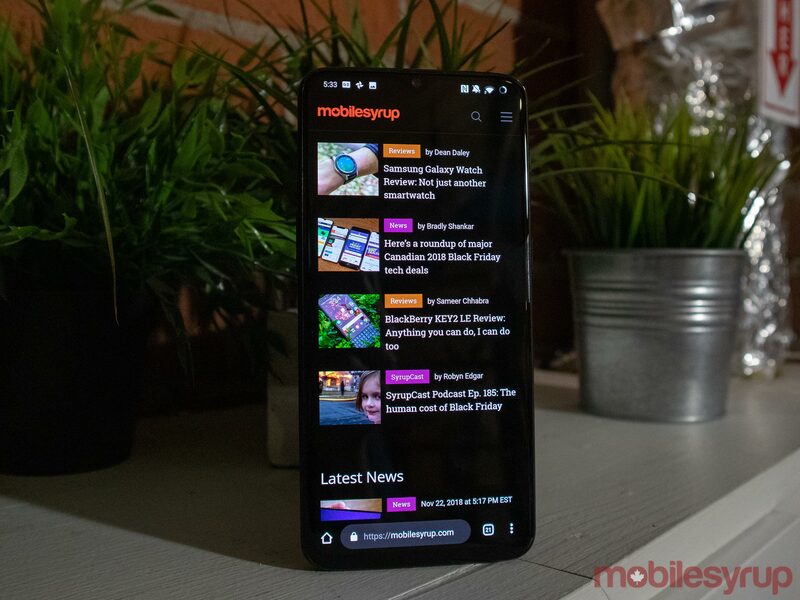 There aren’t many good browsers that support dark mode on mobile, but there are a few options that take the darkness to its limits. Microsoft’s Edge browser has a dark option, but only the search bar and the bottom menu fade to black. The website you’re viewing stays the same — likely a bright white. You can use the browser’s dedicated reading mode to make the website dark, but it cuts the page down to just the pictures and text. Kiwi Browser is another option that’s based on the Chromium framework, so it looks very similar to Google Chrome. It also has the most comprehensive dark mode on this list for Android. Changing to ‘Night Mode’ in the app’s side menu panel adjusts a website’s colours, making whites black and modifying colours accordingly. You can even mess with the contrast and the intensity in the apps’ accessibility settings to achieve the ultimate dark mode. Firefox’s iOS app has a dark mode as good as Kiwi’s. Unfortunately, it lacks a robust dark mode on Android. The iOS Firefox app can adjust from a light theme to a dark theme based on screen brightness. So, if you drop your device’s brightness below 25 percent, the app automatically fades into darkness. Google Keep Notes is typically my go-to note app, but its lack of dark mode makes in annoying to use at times. However, some alternative apps offer extra features over Keep and dark mode to boot. Notion, for one, has a dark mode offer across its iOS, Android and desktop platforms. iOS and Mac users can enjoy Bear’s excellent dark offering too. Finally, Evernote just added a dark mode to its note app. Using a launcher is another great way to darken your device. The Pixel Launcher, for one, has a dark theme option that turns the app drawer and folders a dark grey. However, there are better options for dark mode. Nova Launcher is probably the best in this department since it has a dedicated ‘Night Mode’ that changes the search bar, app drawer, drawer icon and folders all to a darker theme. It can be scheduled as well if you only want a dark theme at night. Even if you don’t want a complete dark mode, you can tweak each aspect of Nova Launcher on your own preferences, while still making it darker than your default option. The Microsoft Launcher is another option that has some dark themes. You can customize it to have dark grey accents instead of the standard white. As a bonus, you can add a theme accent colour as well as giving your phone a distinct look. Not all apps fit into the categories above. Google Maps, for example, has a dark theme of sorts. 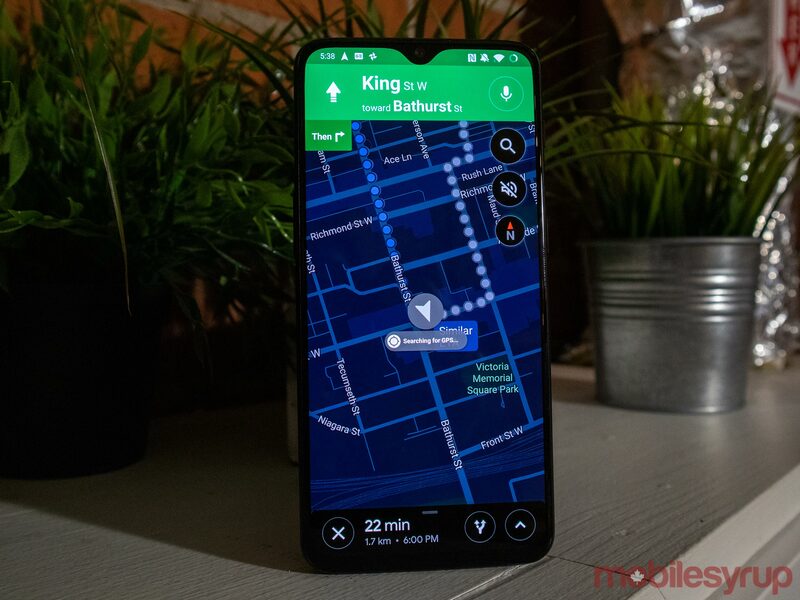 Typically it displays the navigation screen in a dark theme at night. However, users can force this to be always on in the settings. Google’s Contacts app also has a dark mode to accompany its recent all-white redesign. Google Phone has dark mode now too, although the app isn’t really available on non-Pixel phones. Interestingly, Phone and Contacts are linked, so if you enable dark mode in one, it should come on in the other. If you don’t have a Pixel, your phone might have dark mode in the contacts and dialer apps anyway. Both OnePlus and Huawei’s dark theme option affects the dialer app on their phones.